A solid adaptation of a decent novel, The Prestige is a spry magic act with a nifty final sleight of hand. The Prestige tells the tale of rival magicians in early 20th century London. 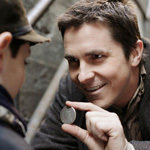 One, Alfred Borden (Christian Bale, The Machinist), is a natural-born magician, a man who can quickly see through the smoke and mirrors and unlock the secrets behind any magic trick. The other is Rupert Angier (Hugh Jackman, X-Men). He doesn’t hold the same ingenuity as Borden, but he becomes obsessed with outdoing Borden at every turn. As their rivalry escalates, the two spar in front of audiences, each one trying to sabotage the other’s tricks. The movie pares back on that historical inspiration, but in exchange it ratchets up the Borden/Angier rivalry, extending the deadly consequences of their ruthlessness to their closest loved ones. The screenplay by brothers Jonathan and Christopher Nolan, who teamed up previously on Memento and are currently at work on The Dark Knight, ups the ante and makes a couple dramatic, but appropriate, departures from the novel in an effort to emphasize the high-risk stakes of the magicians’ duel. Gone is the novel’s cumbersome bookend storyline about distant relatives of Borden and Angier. Instead, Angier’s stage engineer, Cutter (Michael Caine, The Quiet American), serves as the lead narrator, setting the stage by introducing the basic parts of all magic tricks: There’s the pledge, in which the magician introduces an ordinary object to the audience. Then there’s the turn, in which that ordinary object does something extraordinary, like disappearing. Finally, there’s the prestige, in which the object is brought back to its original form. Creating effective illusions is not an easy business, as Borden and Angier can attest. And a great trick’s secret is like gold dust to its creator. Upon retirement, a magician can sell his secrets and thus have a nice nest egg for their golden years. But, at the same time, to reveal a trick’s secret can only lead to disappointment as the extraordinary is brought back down to mundane reality. The Prestige deftly plays off both of those elements; Angier is obsessed with unraveling the secret to Borden’s miraculous new trick, called The Transported Man. In the trick, Borden bounces a rubber ball across the stage, disappears behind one door, only to reappear through a door on the other side of the stage – just in time to catch the bouncing ball. Angier’s obsession takes him to Colorado Springs for a meeting with Nikola Tesla (David Bowie, Labyrinth), himself at odds with his own rival in the electric business, Thomas Edison. Led on by Borden and convinced Tesla’s “real magic” helped Borden with his transporter trick, Angier is willing to pay any sum to get a similar device and – with his panache for showmanship – outdo Borden. Bowie is marvelous as Tesla, who appears as a quiet, calm genius, one all-too painfully aware of the dangers of obsession. For that matter, most of the cast is truly top notch. Particularly, Bale and Caine, reteaming with their Batman Begins director, Christopher Nolan. Jackman also delivers great performances as both Angier and his drunken doppelganger. Surprisingly, the weakest link in this magic trick is Scarlett Johansson as Olivia, the lovely assistant who serves both Borden and Angier on stage and at home. Normally a solid performer who’s comfortable in foreign territory (as in Girl with a Pearl Earring and Scoop), she seems a little out of place amidst the fine-tuned talent of her cast mates; her faux British accent frequently does its own disappearing act. That’s not to say she’s terrible, but she has done better. That one chink aside, The Prestige is an enjoyable, evenly paced period drama. Ultimately a rumination on the power of technology and its innocence-shattering aftershocks, it’s a yarn that doubles as a cautionary tale about obsession and the seduction of the limelight. At first blush, the story’s ending is a letdown, right along the lines of the magicians’ claim that to know a trick’s secret is to know disappointment. But it’s an ending that the movie manages to squeeze a little more grist from by setting up one final confrontation between Borden and Angier. In doing so, it becomes clear Borden and Angier were trying to achieve the same results, the creation of a mind-blowing illusion, by totally disparate means. One approach is innocent enough; the other creates truly life-altering complications. To say more would only spoil the secret.